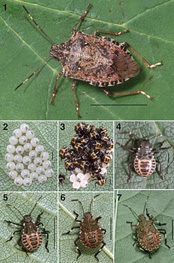 Even though the Brown Marmorated Stink Bug (BMSB) is not known to be currently present in BC, we chose it for this feature since the Fraser Valley is at a relatively high risk for introduction and we will likely be dealing with this pest here before long. BMSB is native to Asia and was first detected in North America in the mid to late 1990s in Pennsylvania. It has spread from there and is currently present throughout the USA (including Washington, Oregon and California) and Eastern Canada, with a high concentration in the eastern mid-Atlantic states. BMSB is a significant agricultural pest because it has a very wide host range. It feeds on over 200 different plant species including vegetables, tree fruits, berries and ornamentals. It uses a long mouthpiece to pierce and feed on leaves and fruits causing distortions and necrotic (dead) spots on the plant and fruit. It is also a harvest contaminant in high value crops like wine grapes, where it will affect the final flavor. BMSB has one generation per year. Overwintering adults emerge in March and April and lay eggs. Offspring emerge in June and nymphs are present throughout the summer. Nymphs go through multiple stages of development and become adults in early fall. Adults will continue to feed until mid-autumn when they will seek overwintering sites. This life cycle data is from the Eastern US, but should not change much in our area. BMSB is also a pest to homeowners, as adults will aggregate on the side of houses in the fall and early winter and can find their way into homes. There are four insecticides already registered in Canada for use in controlling and/or suppressing BMSB. All of the registered products are broad spectrum, so application timings are going to be critical in order to prevent losses of beneficial insects. BMSB is also very mobile, so control with chemicals is going to be difficult, as the pest can repopulate a field from other areas after an insecticide application. Being an introduced pest, BMSB has very few natural predators in North America. BMSB has no local natural predators here. Recently, USDA researchers have been researching a parasitic wasp from Asia that has potential for a release program. Any such release is still years away, but does put hope on the horizon. USDA scientists are also developing a pheromone attractant used to detect and hopefully reduce population numbers. Our best weapon against this pest is exclusion, and failing that, early detection of its presence here. The BC Ministry of Agriculture has put together a brochure asking locals to be on the lookout for this pest, and if found to report it immediately to them (scan the QR code on your smart phone). The BMSB enters new areas mostly by hitchhiking on shipments (plants or otherwise) from infested areas. When buying nursery stock from affected areas, please be careful to buy only from nurseries that are free of this pest.